A group of businesses or nations that act together as a single producer to obtain market control and to influence prices in their favor by limiting production of a product. The United States has laws prohibiting cartels. A small group of companies or governments that regulate the price of a good or service by having total or near total control of a market. Suppose four airline companies control 98% of the market share for passenger flight. If these four companies formed a cartel they could agree to set prices together, which would guarantee profits for all companies because it is extremely unlikely that a fifth company would be able to successfully undercut them. A prominent example of a cartel of governments is OPEC, which effectively can set the price of a barrel of oil by mandating quotas for each company to follow and thereby controlling supply. See also: Price collusion. A group of companies or countries acting together to control the supply and price of certain goods or services. Cartels are formed to produce higher profits than would ordinarily be earned. a form of COLLUSION between a group of suppliers aimed at suppressing competition between themselves, wholly or in part. Cartels can take a number of forms. For example, suppliers may set up a sole selling agency which buys up their individual output at an agreed price and arranges for the marketing of these products on a coordinated basis. Another form is where suppliers operate an agreement (see RESTRICTIVE TRADE AGREEMENT) which sets uniform selling prices for their products, thereby suppressing price competition, but with suppliers then competing for market share through PRODUCT DIFFERENTIATION strategies. A more comprehensive version of a cartel is the application not only of common selling prices and joint marketing, but also of restrictions on production involving the assignment of specific output quotas to individual suppliers, and the making of coordinated capacity adjustments, thereby either removing over-capacity or extending capacity on a coordinated basis. Cartels are usually established either to exploit the joint marketing power of suppliers to extract MONOPOLY profits, or as a means of preventing cutthroat competition from forcing firms to operate at a loss, often resorted to in times of depressed demand (a so-called ‘crisis cartel’). A number of factors are crucial to the successful operation of a cartel, in particular the participation of all significant suppliers of the product and their full compliance with the policies of the cartel. Nonparticipation of some key suppliers and ‘cheating’ by cartel members, together with the ability of buyers to switch to substitute products, may well serve to undermine a cartel's ability to control prices. In many countries, most notably the US, UK and EUROPEAN UNION, cartels concerned with price fixing, market sharing and restrictions on production and capacity are prohibited by law. See COMPETITION POLICY, ORGANIZATION OF PETROLEUM EXPORTING COUNTRIES (OPEC). Fig. 21 Cartel. D is the industry demand curve, showing the aggregate quality that the combined group may sell over a range of possible prices and MR is the industry marginal revenue curve. 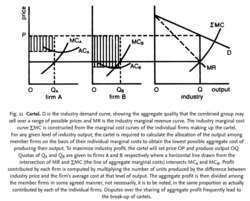 The industry marginal cost curve XMC is constructed from the marginal cost curves of the individual firms making up the cartel. For any given level of industry output, the cartel is required to calculate the allocation of the output among member firms on the basis of their individual marginal costs to obtain the lowest possible aggregate cost of producing their output. To maximize industry profit, the cartel will set price OP and produce output OQ. Quotas of QA and QB are given to firms A and B respectively where a horizontal line drawn from the intersection of MR and XMC (the line of aggregate marginal costs) intersects MCA and MCB. Profit contributed by each firm is computed by multiplying the number of units produced by the difference between industry price and the firm's average cost at that level of output. The aggregate profit is then divided among the member firms in some agreed manner, not necessarily, it is to be noted, in the same proportion as actually contributed by each of the individual firms. Disputes over the sharing of aggregate profit frequently lead to the break-up of cartels. a form of COLLUSION between a group of suppliers aimed at suppressing competition between themselves, wholly or in part. Cartels can take a number of forms. For example, suppliers may set up a sole selling agency that buys up their individual output at an agreed price and arranges for the marketing of these products on a coordinated basis. Another variant is when suppliers operate an agreement (see RESTRICTIVE TRADE AGREEMENT) that sets uniform selling prices for their products, thereby suppressing price competition but with suppliers then competing for market share through PRODUCT DIFFERENTIATION strategies. A more comprehensive version of a cartel is the application not only of common selling prices and joint marketing but also restrictions on production, involving the assignment of specific output quotas to individual suppliers, and coordinated capacity adjustments, either removing over-capacity or extending capacity on a coordinated basis. Cartels are usually established with the purpose of either exploiting the joint market power of suppliers to extract MONOPOLY profits or as a means of preventing cut-throat competition from forcing firms to operate at a loss, often resorted to in times of depressed demand (a so-called ‘crisis cartel’). In the former case, a central administration agency could determine the price and output of the industry, and the output quotas of each of the separate member firms, in such a way as to restrict total industry output and maximize the joint profits of the group. Price and output will thus tend to approximate those of a profit-maximizing monopolist. See Fig. 21 . A number of factors are crucial to the successful operation of a cartel, in particular the participation of all significant suppliers of the product and their full compliance with the policies of the cartel. Non-participation of some key suppliers and ‘cheating’ by cartel members, together with the ability of buyers to switch to substitute products, may well serve to undermine a cartel's ability to control prices. In many countries, including the UK, the USA and the European Union, cartels concerned with price fixing, market sharing and restrictions on production and capacity are prohibited by law. See COMPETITION POLICY (UK), COMPETITION POLICY (EU), ORGANIZATION OF PETROLEUM-EXPORTING COUNTRIES ( OPEC). Price fixing involves much more than meeting once to set a price and then collecting cartel profits for the foreseeable future. In the long run, firms in a cartel maximize their profits by fixing an above-market price and honoring their cartel commitments. Aside from the SPS, the DA also issued its own 'import clearance,' supposedly to screen SPS on the ability of the importers, because some SPS holders simply sold the permits to actual importers-or most likely the cartel. Cartel screens are classified in the literature in two different categories (Harrington, 2008): structural and behavioural. In a report prepared for the UK Office of Fair Trading, Grout & Sonderegger (2005) investigated the structural factors that facilitate the formation of cartels based on both theoretic literature and past evidence from EC and US cartel cases. La asociacion delictiva resulto un exito y se elimino la amenaza de Los Zetas y del Cartel de Tijuana con la union de grupos de sicarios; esa tregua permitio a las ciudades de Chihuahua y Juarez vivir en paz durante un tiempo. El desmantelamiento del Cartel de Juarez y la recaptura del Chapo Guzman el 8 de enero de 2016, asi como las pugnas entre los hijos del capo sinaloense con otras facciones de la organizacion criminal que controlaban la plaza de Chihuahua, fue aprovechado por el CJNG para posicionarse en la zona. Unlike Pablo Escobar, who mostly operated in the United States with a focus on Miami, the Cali Cartel also operated in Western Europe where wholesale prices of cocaine was much higher. This action demonstrates our determination to target both emerging and established leaders within the Sinaloa Cartel, including Felix Beltran as well as Alfonso Limon Sanchez, and to combat their illicit activities through financial sanctions. He has since become one of the top lieutenants of the Sinaloa Cartel, which is responsible for multiple-ton shipments of narcotics from Mexico into the US," said the US Treasury.